Chiselwood accept most credit cards, can package and ship items around New Zealand and worldwide. Carl and Jeanne Beaumont have, over the past 5 years, developed Chiselwood, a small, family owned business,offering high quality, New Zealand made furniture, homeware, jewellery and wood art. Chiselwood evolved from the growing demand for individual pieces of fine furniture and wooden items, constructed from unique New Zealand and overseas timbers sourced from sustainable forests. 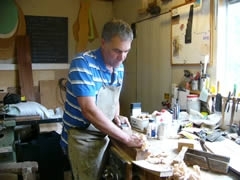 Carl is a formally trained and trade qualified Craftsman Cabinetmaker with over 40yrs experience in furniture and joinery design, construction, repair and restoration. His designs embrace timeless natural beauty and traditional craftsmanship. Carl has a passion for early New Zealand colonial, furniture along with the practical, simple lines of shaker and country styles.